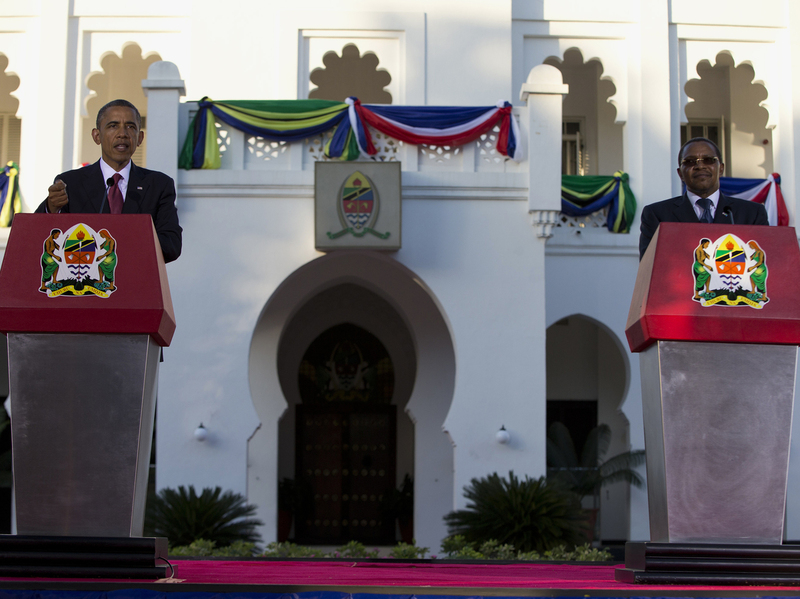 Obama Calls For Collaborative Ties With Tanzania : The Two-Way The president is on the final leg of his visit to Africa. On Tuesday, he and former President George W. Bush will join together for a wreath-laying ceremony at the site of the 1998 bombing at the U.S. Embassy. President Obama and Tanzanian President Jakaya Kikwete take questions at a joint news conference Monday in Dar es Salaam, Tanzania. President Obama kicked off the final leg of his visit to Africa with a stop Monday in Tanzania, saying that he wants the U.S. relationship with the East African nation to be a collaborative one based on development and democracy. "Tanzania is a close partner, as the president [Jakaya Kikwete] indicated, on almost all our major development initiatives, and this reflects our confidence in the people of Tanzania," Obama said in Dar es Salaam. Obama and Kikwete were expected to discuss trade with business leaders who are traveling with the president. On Tuesday, The Associated Press reports, Obama and former President George W. Bush will take part in a wreath-laying ceremony at the site of the 1998 bombing at the U.S. Embassy in Dar es Salaam. Obama then returns to Washington, D.C.
"As outraged Kenyan editorial writers and bloggers have pointed out, Obama will 'fly right past' Kenya — the birthplace of his father — as he comes and goes from Tanzania, the final leg of a trip that also included stops in South Africa and Senegal. "This is particularly galling to Kenyans who have noted that on a European trip in May 2011, Obama made time to celebrate his distant Irish roots by visiting the sleepy village of Moneygall, the birthplace of Obama's great-great-great grandfather."